Louisiana’s group of citizen-sailors banded together on their own initiative to help their neighbors, without any official government involvement. And they’re doing it again. You might grumble at having to pay high prices. But shortages turn disaster areas into looting zones as otherwise law-abiding citizens become desperate for essential supplies. An island already exhausted and resource-depleted from rendering aid to neighboring islands was now the target of a catastrophic storm, the likes of which hadn’t been seen there since 1928. The Jones Act is a stupid regulation that becomes more obviously stupid in the face of a humanitarian crisis. Waive it for Puerto Rico, then destroy it in Congress. 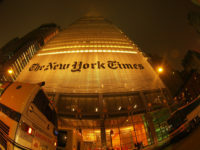 What Do Dems Know About Climate That New York Times Columnists Don’t? Democrats may have read The New York Times’ analysis of the connection between hurricanes and climate change and realized scientists know very little about it. In Houston, Watt has always been a picture of martial spirit, resilience, and protecting his community. It’s no surprise when he asked for help to do just those things in the wake of Harvey, America answered. Houston is still fighting floodwaters from Hurricane Harvey and rescuing thousands of stranded residents. Why didn’t officials order a limited evacuation? In times of tragedy, Americans can still put aside our differences and band together to help one another. The DNC featured a video from James Cameron touting the devastation already happening because of ‘climate change.’ It’s propaganda through and through.